Even though babies are cutest little gifts, they can get cranky and almost nothing can stop them crying... unless you have this adorable dog howling like wolf! A dog is always known to be man’s best friend. They remain so loyal to us that when we have babies they even try to protect and care for them as one of their own. 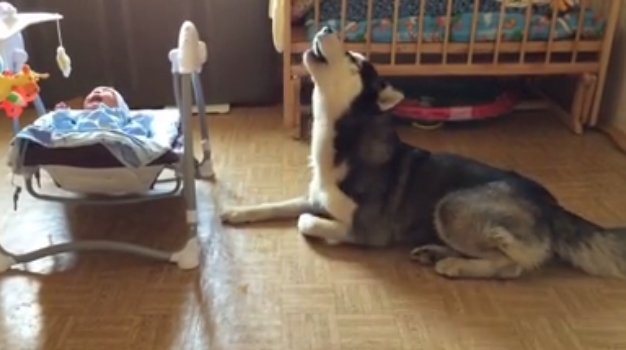 So, when this little baby started crying, this husky dog did something incredible to stop his cry. It may sound really strange if I tell you that the arctic dog starts singing to pacify the child. But it really happened! Monitoring Your Dog’s Behavior: All interactions between your baby and dog should be monitored very carefully. This monitoring should continue until your dog is paying no attention to the infant or is completely friendly toward the baby. Responses to "Heartwarming Moment when a Husky's Howls Lull a Crying Baby to Sleep"
It worked for my 2 everytime! I have a son and a daughter and we had wolf mixes that would howl to let the kids know they were safe and not alone. They would even go over and bonk the swing to get it going again if it stopped. The kds grew up with protectors and family members in this two that we had. Huskies were bred by the Chukchi people partly to be babysitters! I have had several and with little children and babies they are amazing. A couple examples, one night my friend's two little boys (2 and 3 yrs old) went to sleep on the floor of my living room, and my Siberian husky girls made a circle with their bodies around the little boys. Another time a friend visited with her 3 mo old. My male husky stayed near that baby constantly and when the baby cried, Cody nuzzled close to the baby's carrier and often howled but softly. Somehow the baby knew my dog's howl was a good thing. These are really amazing dogs -- but not for everyone.